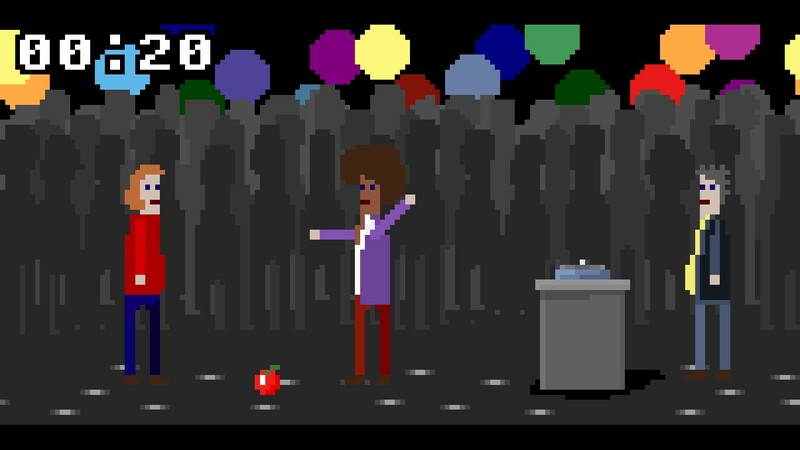 McPixel is a point and click puzzle humor game released by Sos in 2012. The game is made up of dozen 20-second mini-levels where the main character McPixel has 20 seconds to save the day, usually by defusing a bomb. Clear inspiration for the game is the 1980s show MacGyver (which was recently rebooted), known for putting its eponymous hero in tight spots where he had to improvise a solution to a deadly problem in minutes. And to some extent maybe even MacGruber, the Saturday Night Live spoof of MacGyver in recent years–MacGruber came to mind more readily since MacGruber regularly fails to stop the explosions. The controls of the game are very simple–a 20-second timer is counting down, but you have plenty of time to try something, anything, which you do by clicking on objects in the scene. In many cases the bomb is not even visible so you don’t always even have a clear objective, but your path is the same–try clicking on everything. 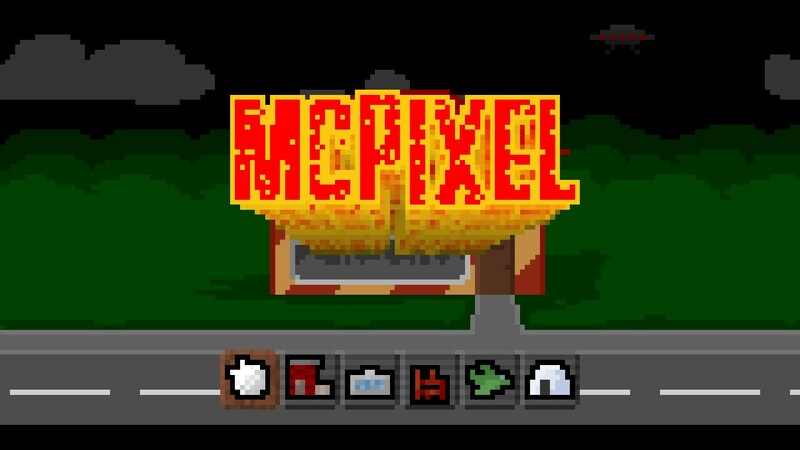 When he’s in a tight spot (and he always is), McPixel’s first resort are kicking, peeing on things, or eating something. Many of the actions he does don’t really make sense for saving the day… but often these things are the ones that actually do save the day, so I guess McPixel just has an uncanny instinct for such things? The game tries for humor by this subversion of expectations, though the punchlines start to feel repetitive pretty fast–repetitive lowbrow humor here (though I still received it better than most Adam Sandler movies). King’s Quest I era graphics. I like SNES-level pixelart, and occasionally have enjoyed very blocky low-res recent releases like Super Amazing Wagon Adventure, but this is going a bit far for my taste. I suppose it does get away with some of the more lewd actions, since it’s kindof hard to be sure exactly what McPixel is doing in some cases. Thankfully, the audio is not from the same era as the graphics (the music on King’s Quest I era games are ear-splittingly shrill). But you’re not really missing anything by playing it muted. The only “challenge” in the game comes from thoroughness–try everything you can think of in every combination to find the solution, and again to find all the gags to unlock extra levels. Some of the extra “challenging” levels might block you for a while, but only because the “active” items on the screen are hidden–which just ended up being a tedious challenge rather than a fun one. Very quick, which makes it easy to pick up and put down. Which, honestly, is most of the reason why I played it, because it’s hard to find games that are so easy to play for less than 5 minutes at a time. Just click on everything methodically. A little bit, to find all the gags and unlock extra levels. 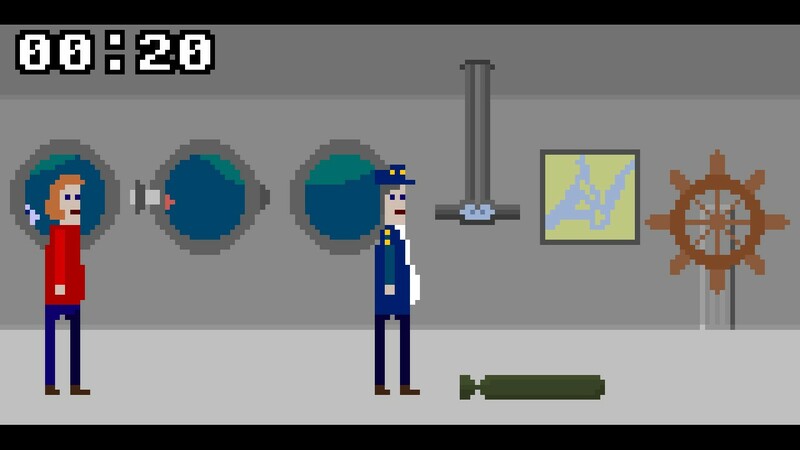 On the one hand, it’s the first game I’ve played based on an endless string of MacGyver/MacGruber mini-levels to defuse bombs. On the other hand, it… got very repetitive very fast, so the originality wore out real fast. There’s only so many people you can kick and only so many fires you can piss on before it starts to feel a little worn out. I didn’t quite finish all of the levels, because I got tired of clicking randomly one of the “harder” levels, where the active items on the screen are hidden so it’s a lot of randomly clicking and then seeing the same actions again and again and again. If you have a very juvenile sense of humor that does not wear out from repetition, if you like games that requires methodic playing rather than action or puzzle or whatever, if you like games with very outdated graphics with a funny premise. If you dig Metroid style platformer-shooters you should enjoy this game (and if you don’t know what a Metroid style platformer-shooter, it’s not a bad choice to be the first of its type you’ve played). Although I played through most of the levels, it was mostly because it’s a quick game to play for just a few minutes, and because it was easy enough that it still drew my completionist side. But it’s a hard game to recommend. $5 on Steam.